Kale Caprese Salad is a fresh take on the Italian classic, filled with kale, basil, tomatoes, mozzarella and a light vinaigrette. Have you ever watched a toddler eat salad? It’s humorous, especially if they are eating it in someone else’s kitchen other than your own. Unless your toddler has great quality control with a fork, the components of the salad are likely to hit the floor. But something magical happened when I gave Joey this kale caprese salad. He ditched the fork and picked the mozzarella and tomatoes [and a little kale] out with his fingers. Lesson learned? 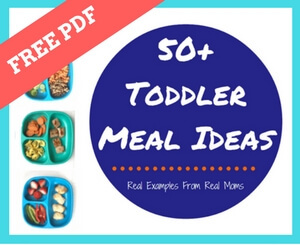 Serve toddlers salads with big mix-in’s! The finger-appropriate foods, the more likely your toddler will try it! Or so that’s what works with my little guy. Here’s to hoping this works in your family too! Combine dressing ingredients and whisk until combined. Pour over kale and toss until evenly coated. Add cheese and tomatoes. Cover and refrigerate for at least one hour before serving. Before serving, add basil and toss to combine. For other in-season produce recipe inspiration, be sure to visit fellow Recipe Redux member recipes! Ahhh I want this for lunch!!! We’re hosting a play date today and I’m wishing I had mozzarella because I have everything else! YUM! This looks so yummy! Love the big mix-ins for toddlers. What a great idea!! I thought I’ve had every version of caprese but never thought of caprese kale salad – great idea! Wonder if I could get my husband too eat kale this way! Love how simplistic this recipe it, and packed with a ton of nutrition. I will definitely have to make this! I love the idea of a kale caprese salad. This would be great to bring for lunch as kale is way less likely to get soggy! I have never had kale with my caprese salad…and now I will!! This sounds so perfect right about now. Wow, I’m so impressed that your toddler eats salad and kale, especially since I know adults who won’t even touch vegetables! Caprese salads are always the best in the summer- I just can’t resist tomatoes! Genius!! I want this for dinner!